This book teaches an absolute beginner the absolute basics of React through design principles, visual-friendly examples, and super practical teaching methodologies. If you want to learn React.js without the fatigue and frustration, this book is for you. It's a book the author put together as he was learning React.js. 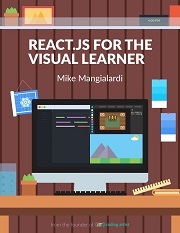 It applies design principles, visual-friendly examples, and super practical teaching methodologies to help the absolute beginner to React.js learn the absolute basics of React.js.